Valentine’s Day is one of my favorite holidays. It’s a day to celebrate LOVE! What’s better than love? Nothing, right? But I’m not going to shower my family with chocolate and processed treats this year. I’m going to show my love in healthy ways. Because striving to be healthier and wanting my family to be healthy is a fantastic way to show love. Skip dinner out and pack a healthy picnic instead. Go to the park if the weather is warm enough. Spread it out on your living room floor if it’s too cold for the outdoors. Enjoy a delicious meal without the crowds and waits that go with restaurants on holidays. Write love letters. Not just to significant others, but to everyone you love. Stick them in your kids lunchbox, on the bathroom mirror, on your mom’s Facebook page. No chalky conversation heart candies required to tell someone how you feel. Do something active. Bowling. Skating. Sledding. Skying. Hiking. Wii Fit. A trip to an indoor inflatable playground. Get out and move together. Hit the farmer’s market together. Encourage everyone to pick some new produce to try. Make sure to let everyone pick their favorite produce, too. Go home and make a big pot of soup together, such as lemon rosemary chicken stew. Pack the soup in a thermos for a picnic or send it in lunches all week. Make doctor appointments. Schedule every family member for dental cleanings and physician checkups. Don’t forget yourself! Show your love through preventive health. Don’t forget the pets! Do something your loved one enjoys with them – especially if you hate it. Even if it involves football, Skylanders, Xbox or the Disney Channel. No complaining or eye rolling allowed. Turn vegetables into art! Cut celery about three inches up from the base. Dip the bottom in paint and then press it onto paper. 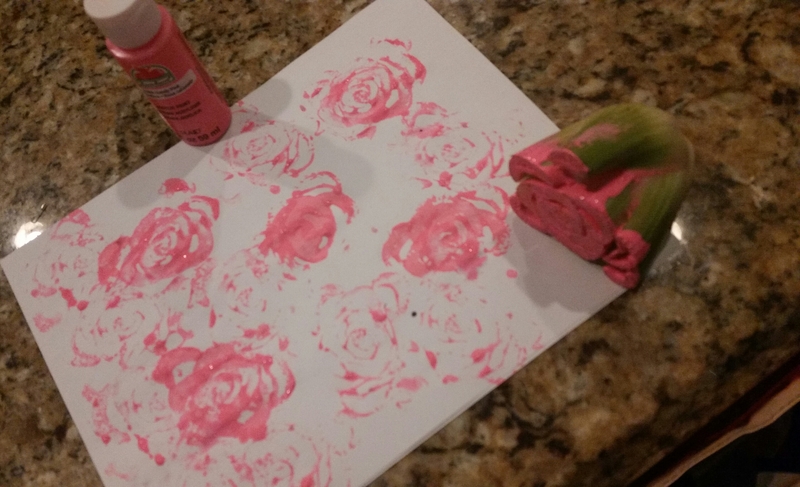 The celery makes a stamp for beautiful roses. Snack on the celery sticks while creating art with your favorite kids. What will my healthy Valentine’s Day look like? I’m going to cover my daughter’s bedroom door in post-it notes declaring all her best non-physical qualities. I’ll do the same for my husband on our bathroom mirror. I’m going to hug them and kiss them and tell them how much I adore them. I’m going to call my mom, grandma and sister to tell them I love them. I’ll post love to my dearest friends through Facebook and text. We’ll hit the Farmer’s Market as a family where we’ll probably pick up a new kind of squash to try. My daughter will head right for the strawberries – or maybe we’ll go to the pick your own patch. We’ll pack a picnic and hit the botanical garden for a long walk. I’ll take my daughter to Ulta and not complain about the hour it takes her to find the perfect shade of nail polish. I’ll watch a movie of my husband’s choosing with him after our girl goes to sleep. Sounds like a great day, right? Most of all, I’ll continue working on making better choices so I’m healthier and around for my family for a long time. What will you do to show your family love this Valentine’s Day? This post is part of the Love Blog Hop with a couple dozen bloggers from Kid Blogger Network hosted by Kiddy Charts. 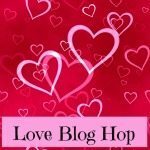 Have a post about Valentine’s Day with kids? The linky lets you share your post, too! Share the badge, share the posts, share the link, share the love! It’s Valentine’s Day after all! Click here to see the complete list of blogs participating! I love the ideas that you have here, particularly pinning the qualities your DD has to her door, that aren’t physical. I think it is so important to emphasise those; particularly with girls as they get older. Thanks so much for joining in with the Love Blog Hop. Thank you for sharing these great healthy ideas! I think we too often forget about our health when there’s so much candy around!